The Kia Cadenza is a full-size sedan with front-wheel drive introduced for 2014 that shares the Kia showroom with the full-size Kia K900 with rear-wheel drive. Nicely styled and appropriately packaged, the Cadenza is a serious contender in its class, compelling for its combination of comfort, premium features and value. 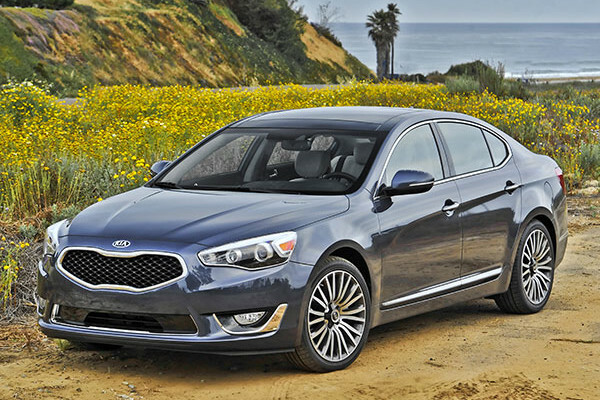 For 2016, Cadenza is available in a less-expensive base model that retails for $32,990. Otherwise, there are no major changes for 2016. Though closely related to the Hyundai Azera, the two differ significantly. Azera’s flowing design, with sculpted sheetmetal, stands apart from the Kia Cadenza’s tauter, athletic appearance. With its 293-horsepower, 3.3-liter V6 developing 255 pound-feet of torque, mating with a 6-speed automatic transmission, the Cadenza feels at least as responsive as other big front-drive premium sedans. 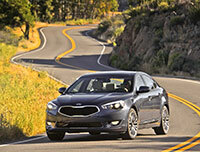 Its light steering and lack of road feel preclude the Cadenza from being called sporty. Instead, it’s an impressively pleasant and quiet-riding large sedan, suffering nearly no wind or road noise. Add impressive interior materials, including the leather upholstery that comes standard, and the Cadenza becomes worthy of notice. Well-equipped even in base trim, the Cadenza can easily move up the luxury scale. Active-safety features are affordable, though not standard. Choosing the Cadenza SX Limited edition or adding a Luxury Plus Package and a Technology Package to the Premium model brings a panoramic sunroof, power retractable sunshade, Nappa leather ventilated seats, smart cruise control, blind-spot detection, rear cross-traffic alert, and lane departure warning, all without passing the $45,000 mark. Mating with a paired smartphone, Kia’s UVO eServices suite includes roadside assistance, a diagnostics assistant, and a parking minder. The touchscreen system responds adeptly to voice commands. Plenty of traditional buttons are included, too. The National Highway Traffic Safety Administration has not crash-tested the Cadenza, but it earned top Good scores from the Insurance Institute for Highway Safety. It’s not yet been subjected to the newer small-overlap test. The 2016 Kia Cadenza comes in three trim levels: base, Premium, and SX Limited. Cadenza ($32,990) comes standard with leather upholstery, dual-zone automatic climate control, 18-inch alloy wheels, power heated front seats, a rearview camera, navigation with an 8-inch touchscreen, and Infinity eight-speaker surround sound. Premium trim ($35,990) adds a panoramic sunroof, paddle shifters, and 12-speaker surround sound. SX Limited ($44,090) includes surround-view cameras, Nappa leather, 19-inch wheels, a rear armrest with USB port, more woodgrain trim, and active-safety features. Eight airbags, a rearview camera and parking sensors are standard. All available active-safety systems, including adaptive cruise control, lane-departure warning and blind-spot detection, are bundled into the Technology Package. Despite being based on the Hyundai Azera, the Kia Cadenza sets its own design path. Interiors and exteriors of the two sedans differ considerably, making it hard to believe that anything is shared. Handsome proportions and an athletic stance enhance Cadenza’s appearance, helped by substantial stretches of unadorned sheetmetal. It might not be a sports sedan, but Kia’s premium sedan looks like one, exhibiting sporadic, subtle hints of European influence. The long, carefully contoured hood and short rear deck make it look more like a rear-drive model than the front-drive car that it is. Subtle bodyside creases direct the eye toward the taillights. Not every large sedan has an interesting profile, but the Cadenza does. Fine detailing and a rich appearance mark the spacious, nicely trimmed interior. The dashboard blends traditional design with leading-edge themes, making use of soft-touch materials with careful woodgraining. All interior materials are impressive. Unlike many contemporary cars, the Cadenza relies on knobs, switches, and buttons instead of electronic controls, and that makes it easier to operate. An analog clock sits below the 8-inch touchscreen. Drivers of various sizes should be able to find a good position, and legroom is quite good. Cadenza can hold five adults. The front seats are too soft; more firmness and bolstering would be welcome. Passengers can expect a whisper-quiet, comfortable ride, devoid of old-fashioned big-car motions. Most Cadenzas are equipped with a two-panel panoramic sunroof, which lets in plenty of light but limits back-seat headroom for taller riders. Rear legroom is sufficient for passengers over six feet tall. Working with an SD card, the standard navigation system is among the best, providing clear and colorful map displays. Scrolling smoothly, it toggles readily between zoom levels, split-screen views, and live traffic warnings. Cadenza accelerates briskly and responds smartly for a full-size sedan, while braking strongly and confidently. At the same time, it exudes calmness, helped by relaxed steering/handling. Anyone seeking a sporty driving experience needs to look elsewhere. In the interest of comfort, Kia elected to omit the sort of athleticism that can make a big front-drive car feel engaging on the road. The steering feels light, though it tightens up when making a turn. Still, the driver can expect no more than a trace of road feel. At cruising speeds, driving demands more attention than usual, and slight adjustments must be made to remain on course. On curvy roads, the Cadenza behaves nicely, as long as you don’t push to hard. The light steering turns into a benefit at low speeds and for parking when the Cadenza maneuvers easily in tight quarters. Engine response varies according to road speed. At lower revs, relatively low torque output tends to limit start-up acceleration. As the V6 builds up speed, the Cadenza becomes a lot more enthusiastic when pushing the gas pedal. Paddle shifters on upper models supplement a shift gate on the console. Because the two top gears in the automatic transmission are rather tall, frequent downshifts can occur on long upgrades. Cadenza lacks a sport mode. Even compared to other large sedans, fuel economy falls somewhat short, EPA-rated at 19/28 mpg City/Highway, or 22 mpg Combined. Hyundai’s Azera scores marginally thriftier, despite using what’s essentially the same powertrain. The Kia Cadenza is a nice premium sedan, though it does not qualify as true luxury. Considering its abundant standard equipment, even in base trim, the Cadenza scores high in the value department. The Cadenza SX Limited comes with just about every available feature.